The day started early, leaving home at 4:15am to walk the kilometre to our local bus stop for the trip to Gosford Station and the early morning train into Sydney's Central Station. I felt sorry for the bleary-eyed commuters, standing in the precise places on the station where the train doors would open, then rushing for a vacant seat and quickly resuming their night's slumber. At Central Station, I had time to buy some breakfast from the cafe before boarding the 7:42am train for Melbourne. Sadly, I couldn't keep my eyes open for the first few hours of the trip out of Sydney but, thereafter, enjoyed the beautiful rural and forest scenery of the NSW Southern Highlands from my window seat on a bright and sunny day. I couldn't resist the offer of a Devonshire morning tea comprising warm scones, jam, cream and a cup of coffee for just $6, despite my vow not to over-eat. Of course it was railway food but, to my unrefined palate, it was fine. 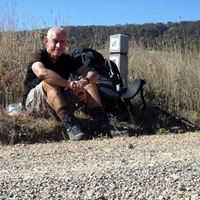 The train reached Yass Junction at 11:30am and I disembarked in warm sunshine on the small pictureque station and found a bench to reorganise my pack for the 4km hike from the station into the town. It was very pleasant walking along in the warm sunshine, although I was a little disturbed by the number of bush flies. They could prove annoying in the days ahead. At 12:30pm I reached my pre-booked motel on the western side of town and checked in. My hefty morning tea meant that I wasn't ready for lunch and I made the decision to rest for an hour or two and then go for a run out to the official starting point of the Hume & Hovell Walking Track at Cooma Cottage, about 5km east of my motel. From Cooma Cottage the route of the trail was back into Yass and past my motel, so I was planning to get this section done today and then start following the trail westwards out of town first thing tomorrow morning. I carry a pair of old running shoes in my pack for around camp and as a backup for boot problems as well as a pair of running shorts for sleeping, so was equipped for a run and set out carrying my camera and GPS around 2:30pm. The run took me through the centre of this small and busy rural town, where I felt a bit out of place in the mid-afternoon, then up a hill on the other side and out into the dry pastoral country, with a few boutique vineyards and wineries. After 30 minutes I reached the gates to Cooma Cottage and found it closed from Mondays to Wednesdays. A little disappointing, but I drive past Yass several times a year on my way to and from Melbourne to visit family so can take a look another time. Cooma Cottage dates from the mid-19th Century and was the home of Hamilton Hume, one of the pair of explorers whose route the walking track roughly follows for 440 kilometres southwest to the Victorian border. Although it was closed to visitors, I took the liberty of wandering around the grounds a little and found the small picnic area and signage marking the official start of my trail. Traffic noise from the main road about 400 metres away spoiled the atmosphere a little, but it was a peaceful and historic place and I took a few minutes to try and imagine the emotions of the explorers who were setting out (though not actually from this spot) nearly two hundred years ago on a much greater adventure than mine. After taking a few pictures I switched on my GPS and ran back into town and on to my motel. After showering and washing out my stuff, I visited a nearby small supermarket to get some insect repellent and a little food before returning to the motel to do my diary and then get some dinner from a nearby take-away food shop. The forecast for tomorrow is much the same as today which means pleasant hiking weather but likely a very cold start. It seems like the temperature will be dropping to around freezing point each night, at best!